I just got finished watching a webinar given by Vena Jones-Cox about Marketing. Over all it was very informative and gave me some good reminders about how to properly market to sellers. I don’t want to rehash the entire lesson, but I do want to touch on some key points that I’m going to incorporate into my next mailing. Your basic message should hit the rough spot of the lead. You want to make their life easier, reduce their problems and help them. For those people who are marketing for probates, think about what problems do people who inherit a house have? Spending thousands of dollars just to fix the place up so you can sell it, maybe? Need to pay off some debt by the end of the month, but there is no way you can sell the house that quickly? Any one else know of a problem area that can be solved? Building a probate list can be as simple as going to the court house and writing down all the names and address for each case file. You’ll get calls from your marketing by mailing to this list, but the responses rate will be very low. Why is that? There are a few reasons why and some good and simple tricks to get a really direct, targeted list. Make sure the probate file has real estate in it. This is as easy as cross checking the deceased name and address in the county tax records. Don’t Mail to Spouses or Parents. 99% of the time a husband, wife, father or mother of the deceased is not going to be happy that you are sending them mail asking to buy their loved ones property. Take these people off your list and save yourself the heart ache of being yelled at and called a “Scum sucking pond feeder”. Only mail to Out of State Executors. Most of my responses so far have been from executors who live out of state. This one is up to you if you really want to save some money and increase your quality response rate. By doing these filter techniques, you’ll be saving money because you aren’t sending mail to leads who have nothing to sell you. You’ll be saving time because you won’t be putting the extra mailers together or answering unmotivated calls. Last but not least you’ll be greatly increasing your response rates. Part #1: Mention their pain, the problem they may be having. If you can get someone to say “yes that is my problem” you’ve hooked them and they will read further. Part #5: Offer them something if they call. Tell them to “Ask about your 48 hours Offer” or “Ask about the free probate report”. These are some very simple yet powerful marketing techniques that will put you ahead of many real estate investors in your area. Another I might add is time between death and letter. I made the awful mistake of sending out letters and it was hardly two weeks since the person dies. It just happened the family was Johnny on the spot to get the notice out. They were also Johnny on the spot letting me know what they thought of me. Emotions are 100% part of these deals. Good stuff. 50% of the new probate notices published in my county give a day of death 3-6months previous. Some more than a year! I think it makes a lot more sense to work the obits first. I’ve seen situations where the property was sold to another investor before the probate notice was published. I also think many estates avoid probate through trusts so they don’t show up. I think by only using probate leads we’re missing the boat on 50% or more of possible deals. I’m going to use a generic we buy houses flyer and/or letter not mentioning anything about probate, or the passing, mailed to the decedant where they lived. If they call upset I deny knowing anything, offer my condolences, give them my spiel, and see when would be a good time to call them if they are interested in selling. That way I’m not seen as a vulture looking to take advantage of a death, to put it bluntly, even if I am. I see what you are saying and agree that we miss some deals because we aren’t mailing earlier. I like your idea of sending just a generic “We Buy Houses” flyer to these people off the obits. Will you still be doing a cross reference with the tax records to make sure that these people owned a home before mailing out? Sorry for the delay but I got involved working a job (just over broke). I took the last month off and have set up with my plan which I have started to implement. I live in FL so check your state laws. I’m focusing the majority of my efforts on estate real estate. Why? BC in my opinion these properties have the best chance for having equity And motivated sellers. If you are going to wholesale I believe, this should be your target. The banks and Fannie and Freddie have pretty much shut down the wholesale simultaneous flipping of shortsales game. Most foreclosures in my state are now upside down. I recently read in FL probate does NOT have to be filed if the only real estate owned is the homestead property of the deceased. In other words, the primary residence. So the probate notices contain only a small fraction of the total estate properties. I do check these, but I also check the obits and the estate and moving sales (looking for out of town owners on moving sales) in a 25 mile radius. I cull the leads based on having no surviving spouse (obits name survivors or check SS Security death index), property value, location, age of the property and amount owed. I work part of two counties and all the info I need is online. There’s no need for me to go to any courthouse. Once I decide to work the lead, I will check to see if it is listed with an re agent. If it is I’ll wait until the listing is 80 days old (check Zillow for the age) and send a postcard. If not listed I’ll send a We Buy Houses pc to the deceased at their primary residence. I don’t believe in sending a special “probate sorry for your loss” type letter. I don’t think anyone believes you are really sorry for their loss. People die. Most in my area were very old. Before I send the same pc in 30 days, I will check for a probate listing, a real estate listing, or a recorded sale. I don’t believe in changing up the format of my marketing. I’d rather send the same thing every time so they remember who I am when they get ready. Regarding the “Estate Sales” you’ll find under garage sale, I plan on going to them in person if I can’t reach someone by phone at the house. Also, if I get the name and number of the representative off a probate listing, I’ll give them a call to see if the property is going on the market before sending something in the mail to them. I’ve dabbled in this before and have spoken with reps.
From my experience over the years I believe the best prospects for this probate game are going to be older properties that require repairs with no local next of kin that figure their going to be landlords. Properties with some overhead or outstanding debts on the estate requiring a fast sale of the property. Squabbling Heirs creating the need for a sale. You should also ask yourself why won’t they just list the house with an re agent? Many try that route. My marketing stresses fast cash. no repairs. no commission. no concessions. no waiting. Hope this helps the cause. Good Hunting. This is the question that I was looking to answer today. What time frame would you suggest? I started, like you, mailing to the notice regardless of the opened date. I feel like we are not timing it correctly. Any suggestions? You kind of just have to test and test some more until you find your sweet spot. Depending on the message, tone and timing there are a lot of variables. I currently don’t send out Direct Mail because I couldn’t consistently fund it from month to month. That is a killer to DM because you have to stay consistent and keep reaching out to the leads. Great post. I especially like the filtering of the court house leads to just out of staters. Great idea! Vena is just great! I have a some of her programs. Have you ever gone to the OREIA conference in Ohio? It is around the first of November every year, is very affordable and has a couple of days of top notch speakers. Vena is a big part of that conference every year. You might want to check it out online. I haven’t gone to an OREIA conference yet. Funny you mention that though as this years event was brought up at my reia meeting last night. It’s going to be Nov 11th to 14th. I have gone a number of times and it is always great. You should try to go. Help!!!! this my proplem my sister was to get a probate lawyer to settle a lawsuit . Now I got a letter from her with no lawyers letter head or nothing no name of the lawyer nata. the said I —– give up all claims to mother it give her name the it said sign here and noterrise it. The letter look like something out of the internet home made probate letter what do you think about this?? anybody please ! hello , what can i say in a letter to a probate attorney? Should i say please keep me on file if he has any cleints that want to sell their property? I’ve never actually gone and send a letter to the probate attorney but it is a good strategy. I would just be honest and straight forward. Tell the attorney what you are looking for and how you can help him/her as well. Just like with sellers, I’d be persistent as well. Sorry I couldn’t give you exact wording, but it’s better if it comes from you. I have to disagree with your advice on only mailing to out of state executors. 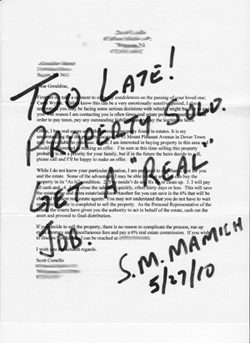 All of the probated that I have bought, so far, have not been out of state. Maybe with larger volume the averages might work out that out of state executors are better leads to focus your attention but I have not seen that. You might be throwing a lot of good leads away. Perhaps you are right. That was just my experience in NJ. Plus I only had a limited budget so I had to draw a line in the sand some where. I am new to this, any systems I can invest in for letter templates or follow ups? I started out with Ron Meads’ probate course. It’s cheap and has a template that is good. Sorry Jim, Ron has discontinued his Probate Course. Just wondering can you offer any feedback on sending heirs/estate reps a postcard that directs them to call a pre-recorded message thats about 90 seconds explaining the services that we offer and how we can help/assist in dealing with the property. Just to add I’ve had fairly good success sending absentee owners recored messages..
I’ve never had much success with Postcards in my area, so I can’t give any feedback on that. I’m not a huge fan of sending people to an automated message. Mainly for the fact that if I where to ever call a number and get a pre-recorded message I’d probably hang up immediately and call someone else. You can also call the Probate Court or Circuit Court & make an appointment in the correct location. Make sure you get together everything you have to bring the court, take the assets list and estimated values, the will and deceased death. Hope this makes sense and helps you. how many have you sold? how do you get a buyer? I’m not sure exactly what you are asking, but as long as you get the property under contract at good value, finding a buyer is easy. To find buyers, you need to do the ground work before even finding deals. Get to know the players in your area so you can reach out to them when you get something under contract. Hey Scott, my name is Jack Simmons. I saw where you purchased Ron Meade,s book. I purchased Ron’s book also. How long have you been investing in probates, has Ron’s book helped you. I have read a lot of stuff on yutube concerning probate real estate investing. But for some reason. Ron’s appears to be simple and straight. Do you care to comment for me, please. Oh yes approximately how many probates do you average a month and how long did it take you to do your first probate deal.